This week’s Finish the Sentence Friday prompt is “The Last Book I read was….”. As I am no longer the avid reader that I once was (the whole “reading glasses” situation is explained below), the last book that I DID read was close to a year ago, now. The subject matter being two subjects that I can relate to and also very close to my heart; I had no problem getting through it (even with the glasses) and I thought this would be a good opportunity to share my thoughts again. I have to begin by saying that I always loved to read, until I hit the age where my arms were no longer long enough to see the pages clearly and I had to begin wearing the dreaded “reading glasses”. I do not know why reading a book while wearing the dreaded “reading glasses” bothers me so, but it does. Although I have from time to time, purchased a book with all good intentions, I can’t say I have been able to get through a single one. 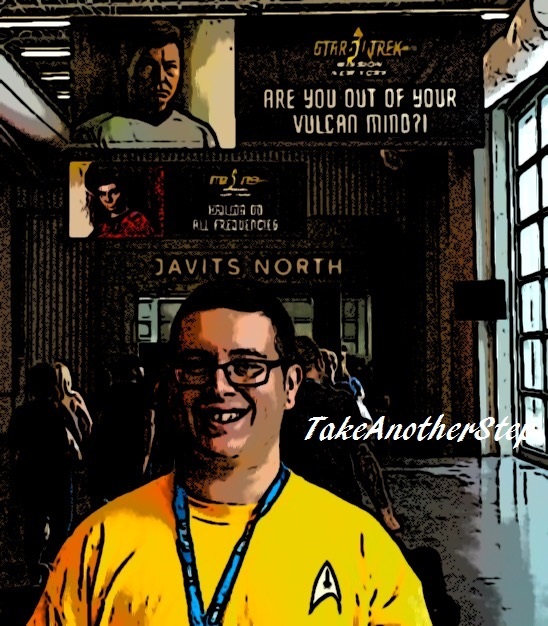 The subject of Star Trek and autism relating to each other was intriguing to me. 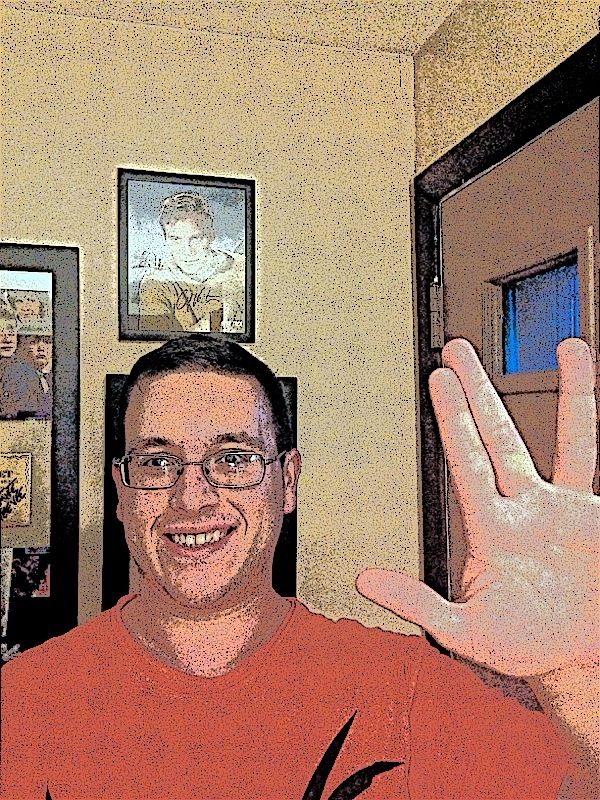 I have been a Star Trek fan since the first episode of The Original Series hit the airwaves; a VERY long time. I have a parent to a child with autism for over a quarter of a century. These are two subjects that I can relate to more than most. I have always looked at Star Trek as diverse and inclusive. 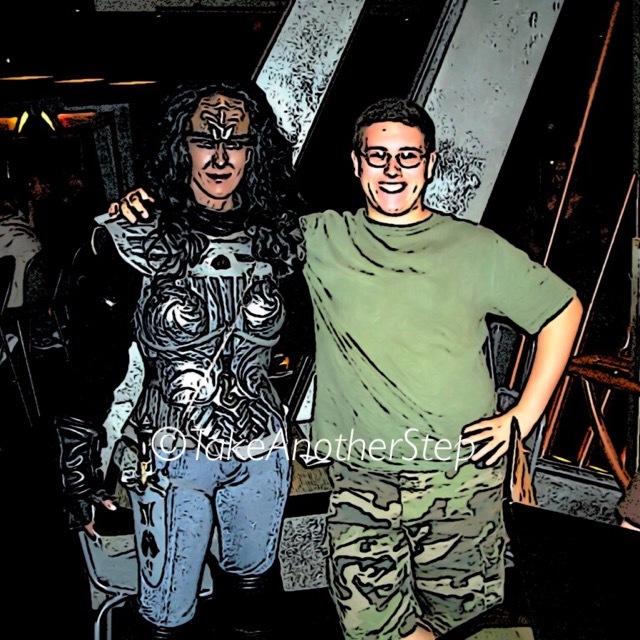 After my son was diagnosed and as he got older, I of course saw the similarities between him and Mr. Spock, Data, and Seven of Nine, but it never occurred to me just how much more there could be found in the Star Trek Universe. 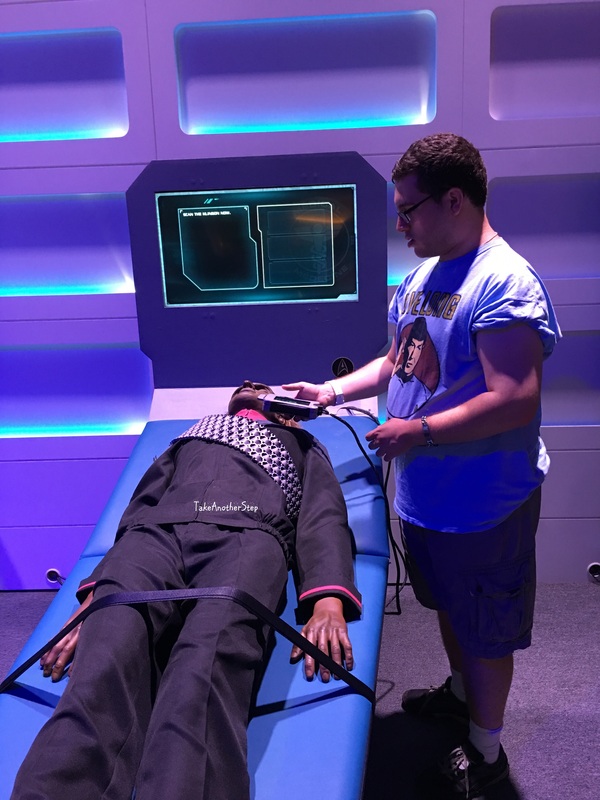 It was fun and eye-opening to look at Star Trek again though the scope of autism. It took me a little while to begin reading it, because….. “reading glasses”, but once I picked it up, I was pleasantly surprised at how quickly I was able to finish it – glasses or not. It was an easy read. It was not clinical or technical. It does not read like a “how to”, or an instruction manual. There is no advice or counsel as to what you should or should not be doing. It does not preach. What the book does, is point out the regular every day issues that our children deal with through Star Trek episodes. It provides thoughts and tips for discussion as a means of assisting our children though these issues. It is a collection of episodes and specific scenarios from those episodes that are relevant to our day-to-day life. These situations and the manner in which they are resolved are broken down in a clear and simple manner to promote thought, discussion and understanding about anxiety, social situations, problem solving and much more. Once you read this book and begin looking at the episodes in this way, this method could then be applied to other episodes, other situations in the same episodes and even different television shows, movies or books. Being a Star Trek fan, it was actually fun reading over all of these episodes and looking at them in this light. 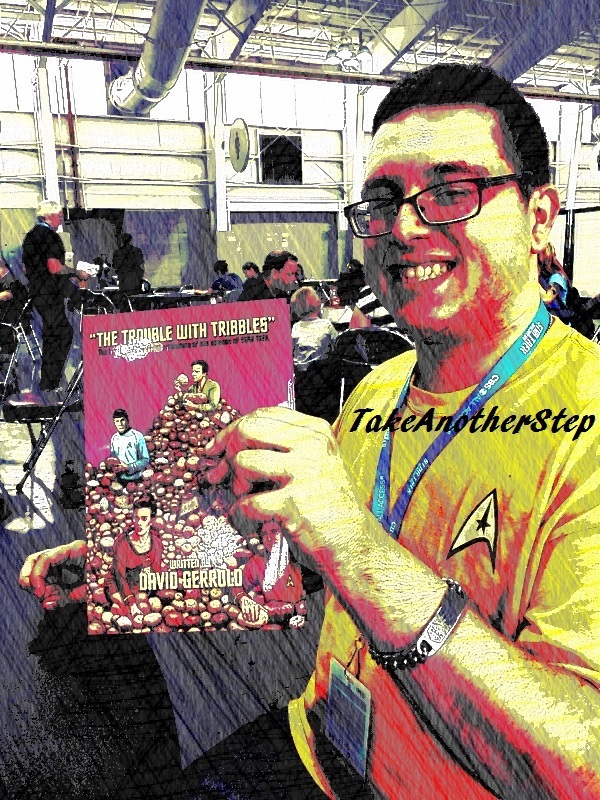 If you are a Star Trek fan with some connection to autism; this book is definitely for you. 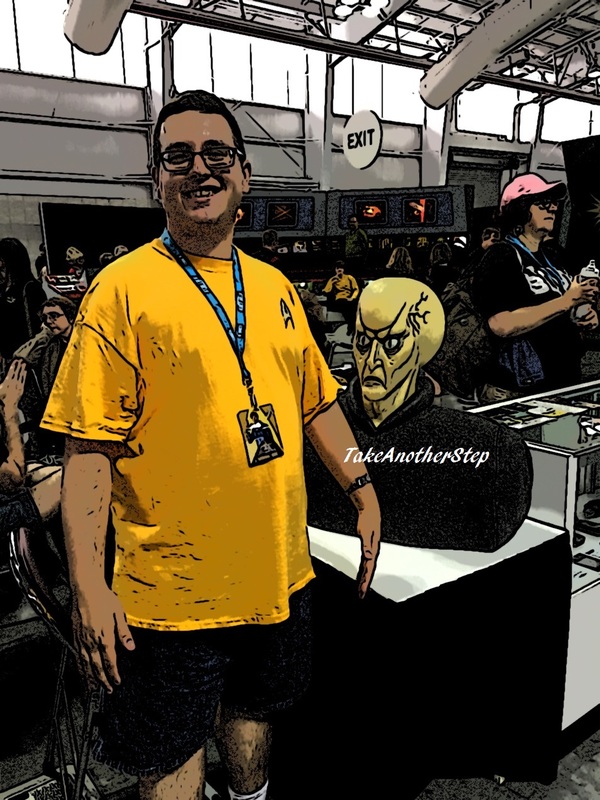 If you are a Star Trek fan who may want to learn a little bit about autism while reading synopses of episodes from most of the Star Trek television series; this book is also for you. 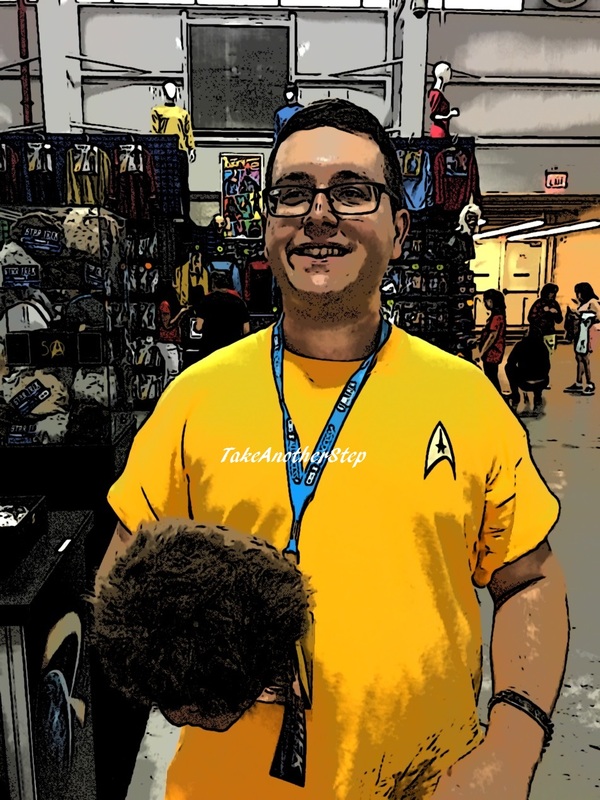 If you are a Star Trek fan and the parent of a neurotypical child; this book can also be helpful as many of the issues covered such as bullying, acceptance or fitting in and peer pressure are not specific to autism. 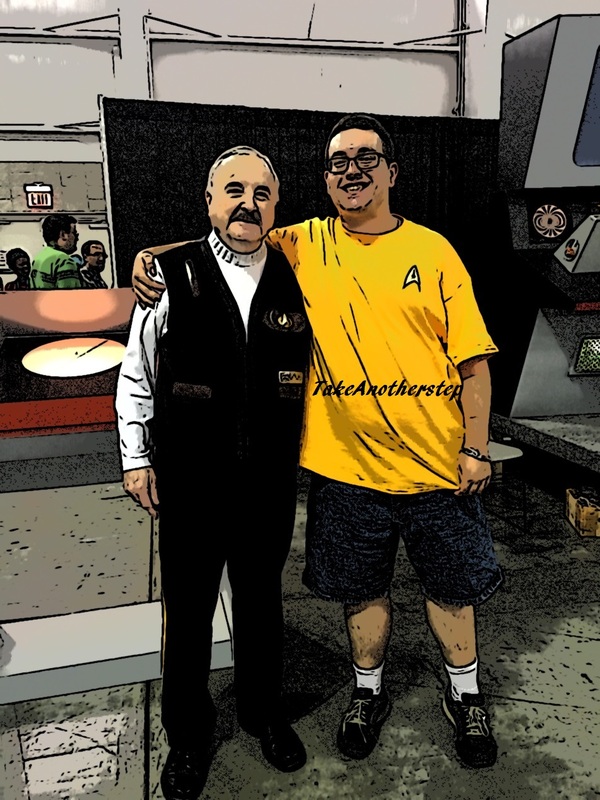 If you are not a Star Trek fan; first I will ask ……..
Next I will say that I do not think it matters. I have to admit that there were a few episodes that I did not remember and it did not take anything away from the point of the book. To the Star Trek novice or the person who has no knowledge of the franchise other than the name, I believe this book would be just as interesting and informative to read as a collection of short story synopses that begin with a problem, end with a solution and the break down of the steps the characters took to get to that solution. 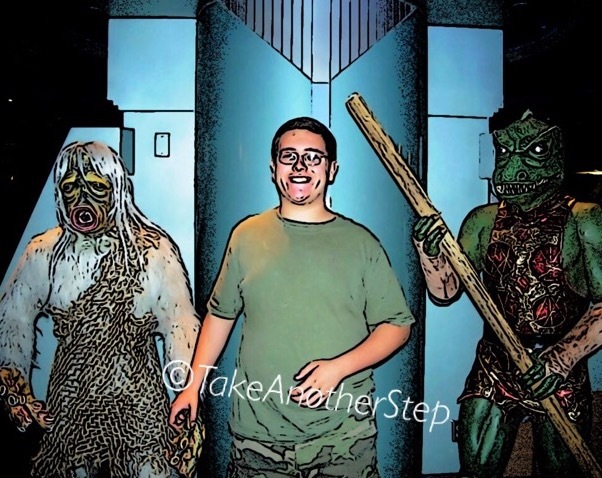 I found “To Explore Strange New Worlds – Understanding Autism through a Star Trek Lens” a fun, informative and quite fascinating romp through the Star Trek Universe and the autism spectrum. I highly recommend it! I Got Distracted on Star Trek Day…. I have been re-watching the Star Trek series over the last year and a half/two years now. 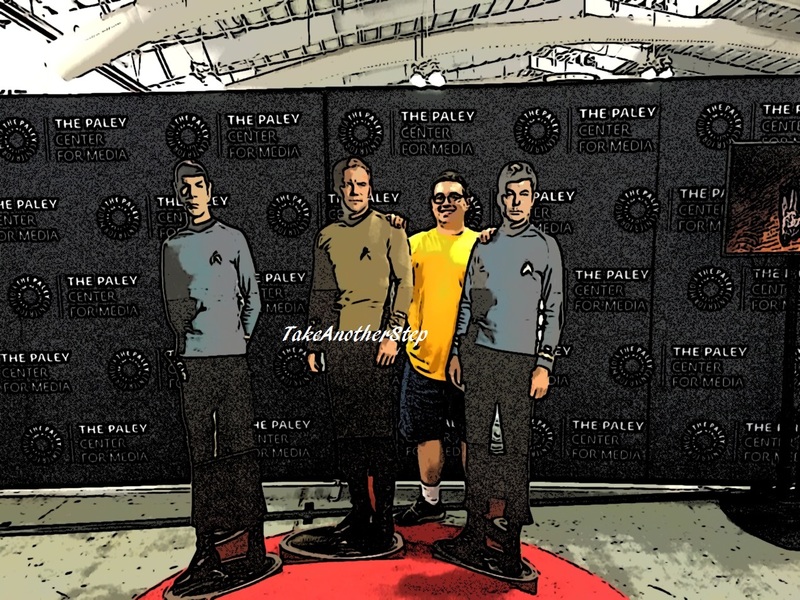 Because some of my perspectives have changed, I was ready to write about it on September 8th; Star Trek Day, but I got distracted and almost completely missed Star Trek Day altogether. 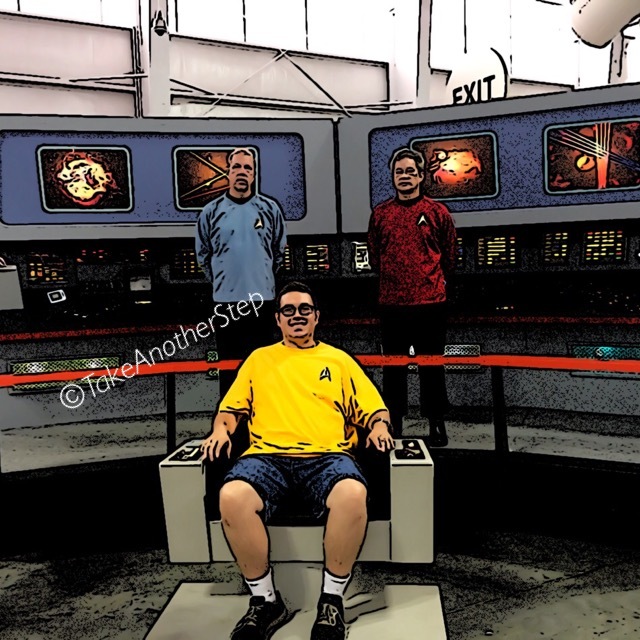 Those of you that know me know that I have been a Star Trek fan from the time that the very first episode aired of the Original Series. Way before it was “cool” (I’m old). There was and still is nothing not to love about the Original – nothing. I had been finding it difficult getting into any new shows so instead of going back to my “happy shows” that I have no problem watching over and over and over again (The West Wing, Eureka, Parks and Recreation, Angel and the Gilmore Girls), I thought that since I really have not seen an episode of any of the series in the Star Trek franchise in many years; why not try one or all of them? A trip down memory lane would be fun. You have to remember that when most of these series originally aired; specifically TOS, TNG and DS9, we were able to see them in first run and maybe if we were lucky we would catch a re-run from time to time. Movies were just beginning to be released on video but television series were not. When the Original Series ran, back in the old days of getting up to change between the three network channels and maybe a 4th UHF channel if you moved the antenna in just the right way – video was not even a thought. By the time The Next Generation hit the airwaves, we did have the capability of recording shows from the TV set to VHS, but it would be another few years before I figured out how to do that (more than a few years, if I am honest). So for many of these series, I saw them once when they aired and really never again other than a random re-run here and there. I have always had an affinity to Deep Space 9 but it aired at odd times, like Sunday at 5:00pm or some odd, not in prime-time slot that seemed to change often. I was able to catch enough episodes to know most of the characters and keep up with some of the story lines. I started my quest to re-watch all of the series with DS9. I was not disappointed. Deep Space 9 has now been added to the list of television shows that I can and will watch over and over again. It was different but there was no mistaking that it was still Star Trek. Although Deep Space 9 is a permanent space station there was quite a lot of action and travel on the Defiant once the war with the Dominion broke out. 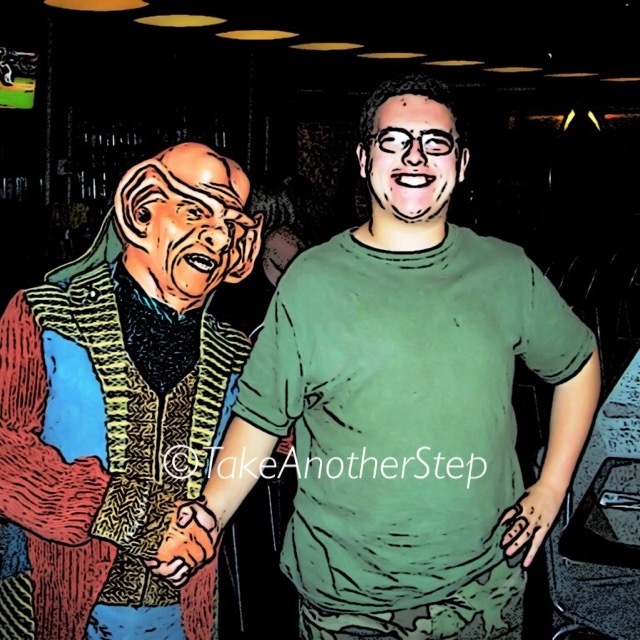 I liked the way the characters evolved and changed from the beginning of the series (even the Ferengi’s), in a way that I did not really see in Next Gen. I particularly LOVED the relationship between Chief O’Brien and Dr. Bashir. Watching the characters move from just tolerating each other to best friends spending almost all of their time together was just adorable. Jake and Nog come in a close second in “adorable best friends” category. Commander, Captain…. Emissary of the Prophets – trapped between the two different and often-times conflicting worlds of The Federation and the Bajoran people. By far, my favorite captain. Deep Space 9 is a little bit darker than most of the other Star Trek series but I think that just makes it better and less predictable. The series is available on Netflix. If you are a Star Trek fan (even if you are not) I would recommend it highly. Do not give up after the pilot episode. There is something odd about it. I can not put my finger on it. I do not know if it is the way it was shot or what, but everyone seems to be over acting as if they were over compensating for sound effects that were to be added later but never were. If you watch nothing else, please watch Trials and Tribble-ations in season 5, where the crew goes back in time to the Original Series The Trouble with Tribbles episode. So cleverly done! There is even a funny little call out/acknowledgement to the difference between the Klingons of the past and the Klingons of the present. Although Raktajino was the “coffee” of choice by most of the DS9 world, one could always count on Chief O’Brien to go old school with his order of “coffee. black, double sweet”. I can forgive Commander (later Captain) Sisko for his Raktajino addiction as Raktajino is “techinally” coffee; Klingon coffee. After finishing DS9, I decided to give Enterprise a try. This is the series I had never seen. I watched one episode….. Nope. The theme song…. Nope. Voyager turned out to be another series that was better than I remembered. After getting over (or used to) the Katherine Hepburn impersonation which was not as noticeable watching it once a week as it was binge watching, I really enjoyed it. The first female captain and an avid/can’t start the day without, coffee drinker to boot. Again, I enjoyed the evolution of the characters and the friendships that developed; my favorite being Seven of Nine and Naomi Wildman. The added suspense of the “will they or won’t they” was enjoyably different. They picked up strays along the way and made them part of their crew. 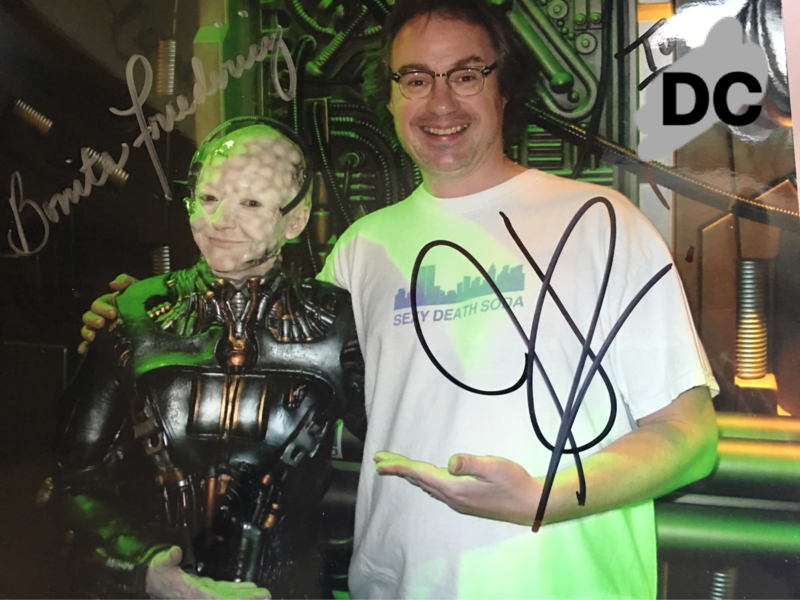 Everyone was welcome; the Marquis, Aliens and even The Borg. There was so much there that I did not remember from watching it the first time through all those years ago. It was very much worth the re-watch. There is a case to be made about leaving well enough alone. There are some series, LOST and Mad Men to name a couple, that I absolutely loved, loved, loved obsessively but never had the desire to go back and watch again. I wanted to leave them where and how I remembered them. Not to in any way diminish my love for my “happy shows”; they are just different in my mind. This is where I should have left The Next Generation. I should have left it in my memory as one of the most popular series of the franchise. But….. NOooooo, I had to go and watch it again. Turns out that the memory of it rated much higher than the reality of it. Although there are characters that still measure up with those from my memory; Geordi, Data, Wesley and Guinan, I am really struggling with each and every episode. I remember really liking this series, but I found it extremely boring and ridiculously predictable after the first couple of seasons. I do not feel any attachment to any of the other characters. I find myself fast forwarding through scenes of characters that I once thought were fantastic. Commander Riker, who was thought to be the Kirk-like ladies man, now just strikes me as creepy. Even Captain Picard does not measure up to my memory of him. Mr. Worf ? I liked the character much better once he transferred to DS9. It is funny how looking at something with older eyes can change your perspective this much. I began trying to watch TNG in August of last year (maybe even before that) and 11 months later, I am finally into the 7th season (while alternating with DS9 for the second time). I am so positively bored by it that I went back to try Enterprise one more time. I am now on the 10th episode. It is holding my attention this time around (fast forwarding through the theme song, of course). Maybe the sheer boredom of the Next Generation made Enterprise more watchable for me. We will see…. I had round two of oral surgery on the 8th which is what distracted me from remembering Star Trek Day ahead of time. Round one happened in July. So yes, I am not only old, but a walking disaster. Round one was just brutal so I was home…. a lot.. . I gave in to pressure and decided to give the reboots a chance. I really did enjoy all of them. I was happy to see Leonard Nimoy. No matter how many re-boots and new series they make, Mr Spock, played by Leonard Nimoy will always and forever be my favorite character in the Star Trek Universe. I went into the first one with a bad attitude and was pleasantly surprised. The movie reverts back to previous characters and stories from the Original Series and then they give it all a twist. Everything is different but still somewhat the same. Karl Urban was the perfect choice to play Dr. McCoy. One can see a young DeForest Kelley and imagine him behaving and looking exactly like this in his early Star Fleet days. He absolutely nailed the McCoy character, in my opinion. Were Star Fleet officers and personnel not trained in the art of holding on to one’s phaser in the early days? Mere seconds into every fight scene the phaser is knocked out of their hand! Every Time!!!! Why, Oh, Why would anyone cast Idris Elba in ANYTHING and not show his face until very close to the end????? As for Next Generation; I am determined to finish watching it. Maybe once I am finished, I will feel differently. I will continue to kick myself for not just leaving it in my memory as a show that I once loved. 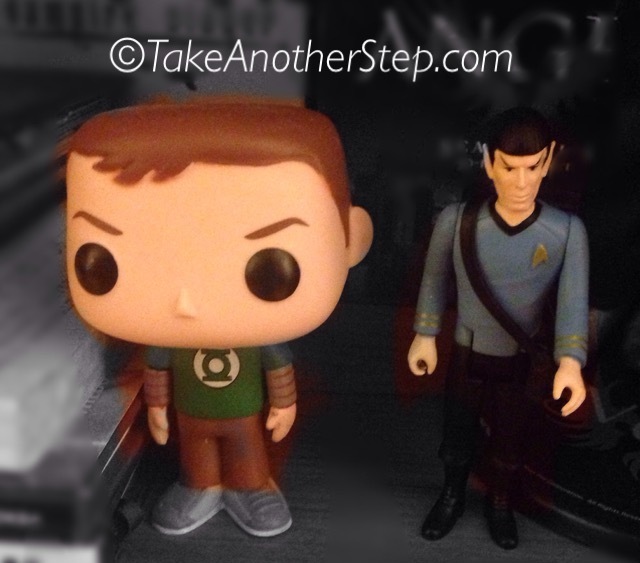 Happy Belated Star Trek Day! 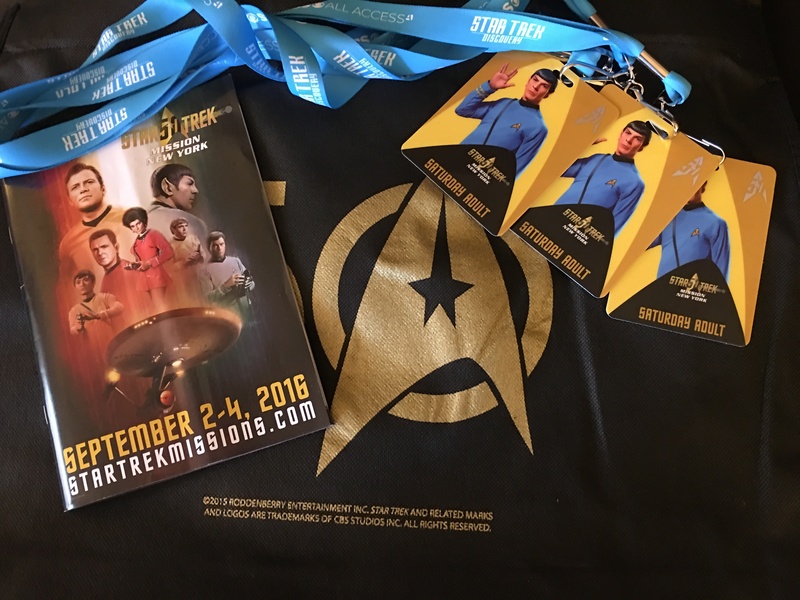 I just happened to actually read my email one day in mid-August and I saw the announcement for Star Trek Mission NY on Labor Day weekend. I bought the tickets almost immediately. I have been a fan of Star Trek from the time the very first episode aired back in 1966 – <sarcasm font> I was just an infant, not even born, yet really <end sarcasm font>, so needless to say, I was excited. The first obstacle for DC would be going to New York City (his favorite place) without visiting “DC’s New York City”; meaning the big Barnes and Noble, the Disney Store, the Eloise Store in the Plaza, Hershey Store, Hard Rock Café and ‘Citral’ Park (Central Park). I began explaining this to him weeks beforehand. We also promised him that we would go back another day very soon to spend the day doing his favorite things. As much as he seems to understand when I am prepping him for something, I never really know if he does until I get his reaction when it happens. I have to say that I did expect some kind of reaction to not going out into the city when we arrived, but the promise of going back another day seemed to be good enough. – Progress! 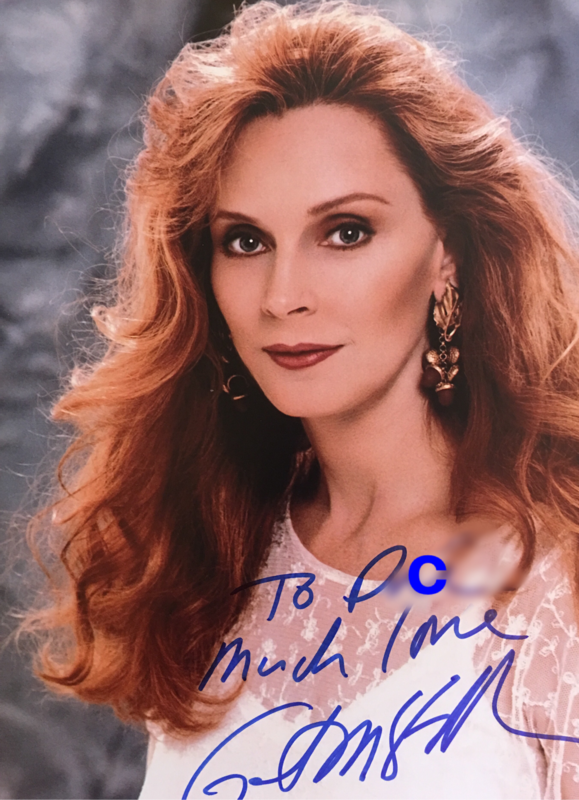 DC knows Star Trek TOS because he has me for a mother, of course. One of his first “signs” before he could speak was the “Live Long and Prosper” sign. Of course he did not know it meant LLAP, it was just his sign for Star Trek in general. 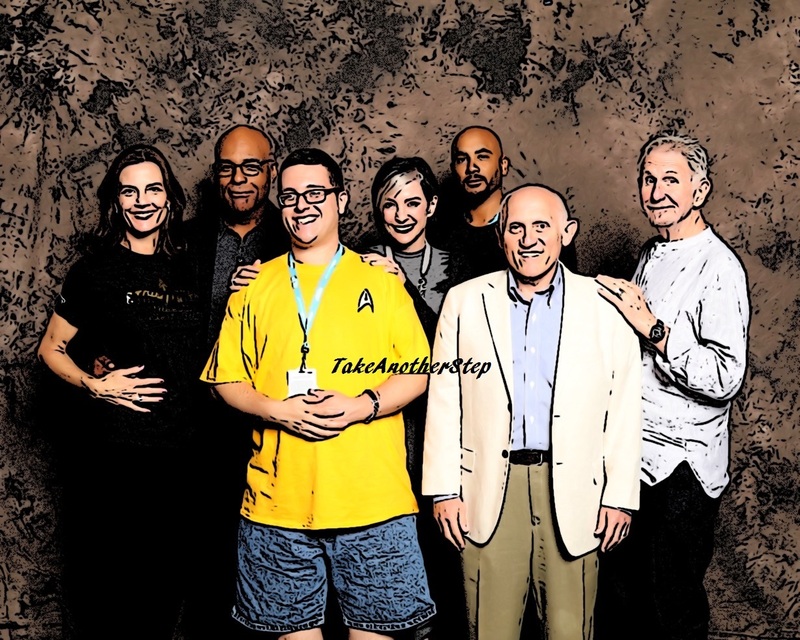 I have seen all of the incarnations of Star Trek over the years with the exception of Enterprise so I knew most of the guests that would be in attendance. DC? Not so much. We have been watching the original series on Netflix in the mornings before work and about a month ago we began alternating between that and Deep Space 9, so I was hopeful he would recognize a few others. We got there not very long after the doors opened and I was amazed that it was not very crowded at all. I don’t know if it was because it was the very first one, the holiday weekend or if this was just the crowd they were expecting; in any case it worked out perfectly for us. The first thing DC came upon was a Tribble and he had to have it. When he found that it made “Tribble” noises, he had to have it even more. His normal “Arrival Anxiety” did not rear it’s head as it usually does when we first arrive anywhere. I was a bit surprised but relieved. 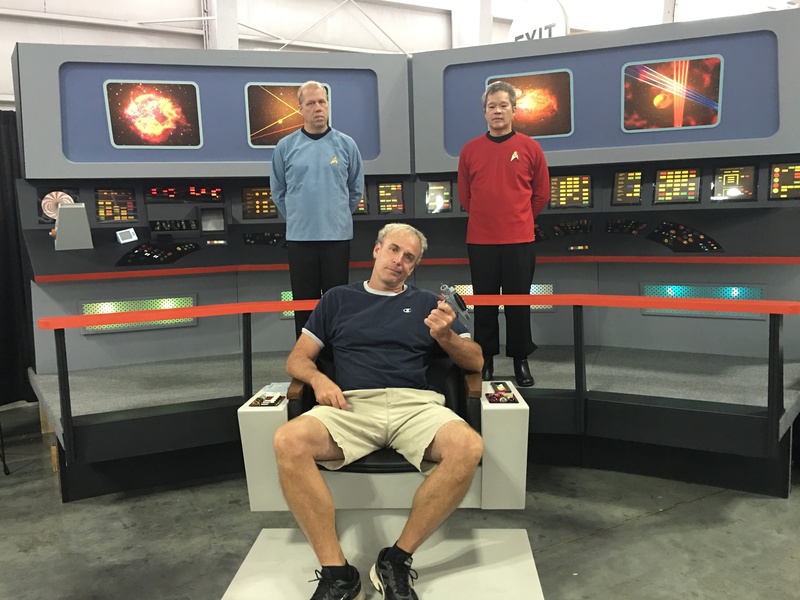 We walked the show floor and came upon an Enterprise set where one could sit in the Captain’s chair. It was a long line, but he was all for it. There was also a man off to the side of the set who looked so much like “Scotty” that I had to do a double take. It unnerved me for a second. 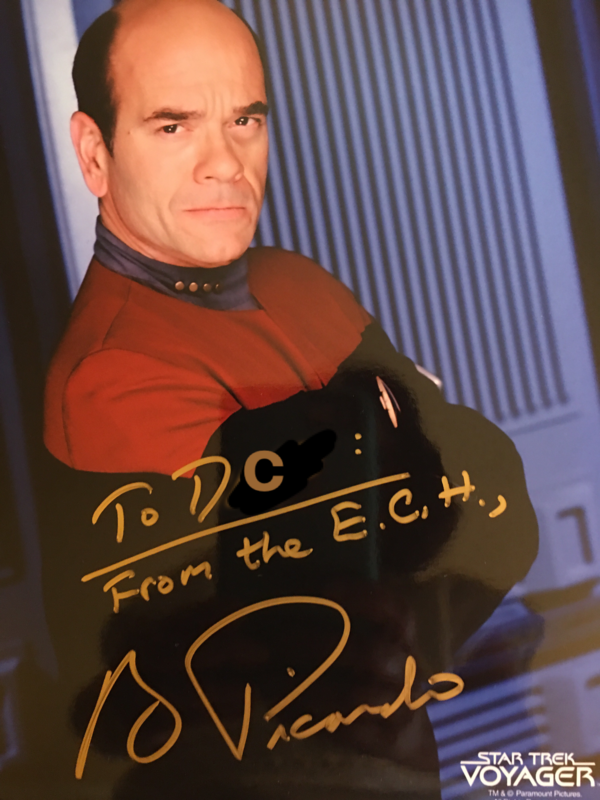 Picardo from the Baltimore Con a few years ago so we headed there first. For some reason, this is where his anxiety set in. The line was short, very short and as I said the hall was not crowded at all but this was where it hit. He started flapping angrily and making a horrendous noise. He used to make a clucking noise but it has evolved into something unrecognizable lately. In-between the flapping and the extremely loud noises he would stop only to say he was sorry and then start again. I could see that the woman in front of us getting a little bit nervous, but I just kept telling him to do what he had to do to calm down and as long as there was no one around for him to hit with his flapping arms, it was okay. She seemed to relax, I suppose because she saw I wasn’t treating it as a big deal. He did finally relax too. 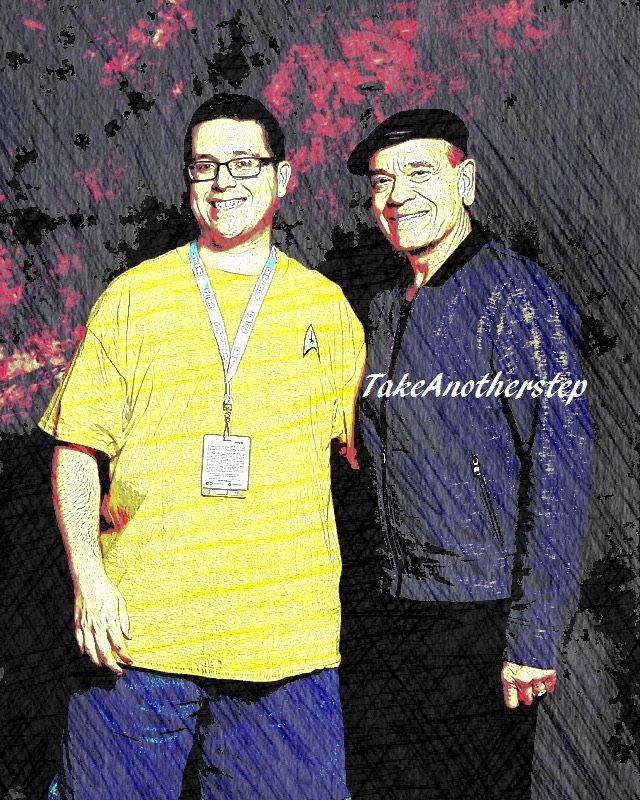 To keep him relaxed, I joked that he should not do that when he got to the table because he would scare Robert Picardo. He laughed. Still trying to keep his mind off of his anxiety, I asked him who we were going to look for next. 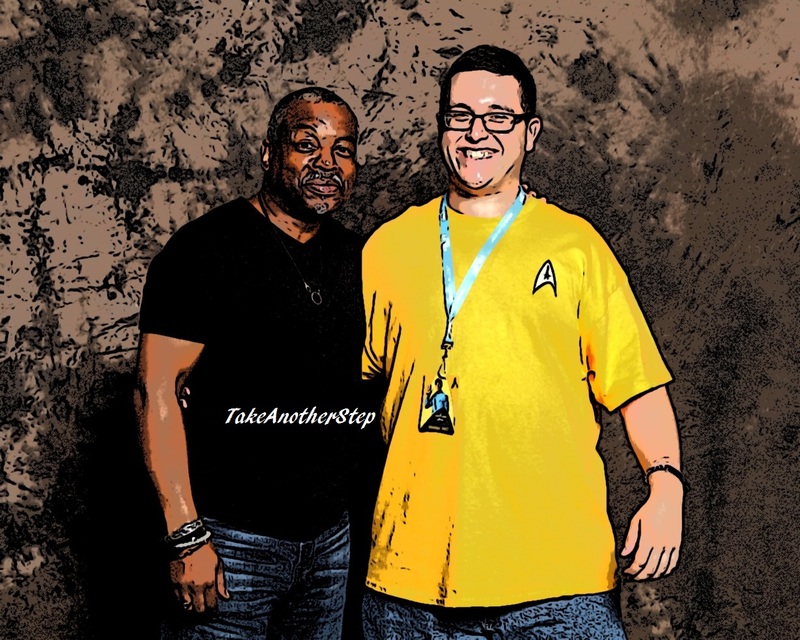 The anticipation of meeting “Reading Rainbow Man” (DC-speak) took his mind off of whatever was making him anxious and he was back to his perfectly happy self when he got to the front of the line. 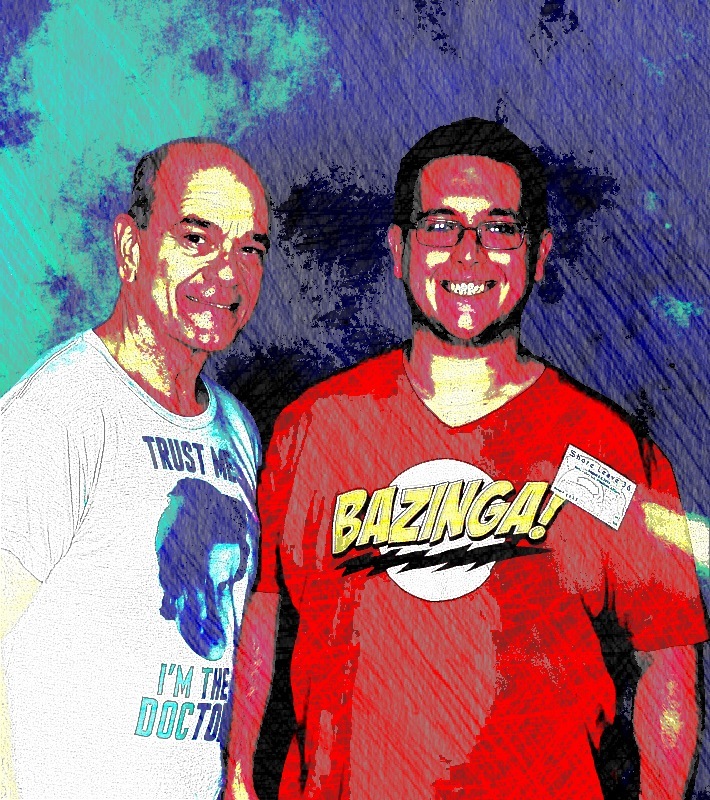 He got Robert Picardo’s autograph and we set out on our hunt for Reading Rainbow Man. Me: He asked how are you, not how old are you. The conversation continued pretty much like that, with me jumping in to translate when necessary. DC had been looking so forward to meeting him and was so very excited when he did that I was kicking myself for not thinking about saving this meeting until later. 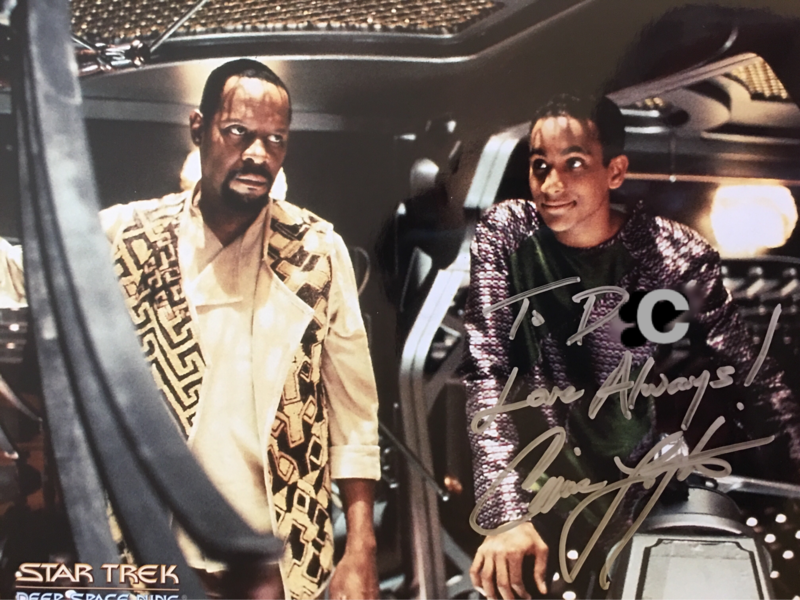 I was worried that after meeting LeVar he would not be interested in staying any longer, but he surprised me once again and wanted to move on to the next meeting. 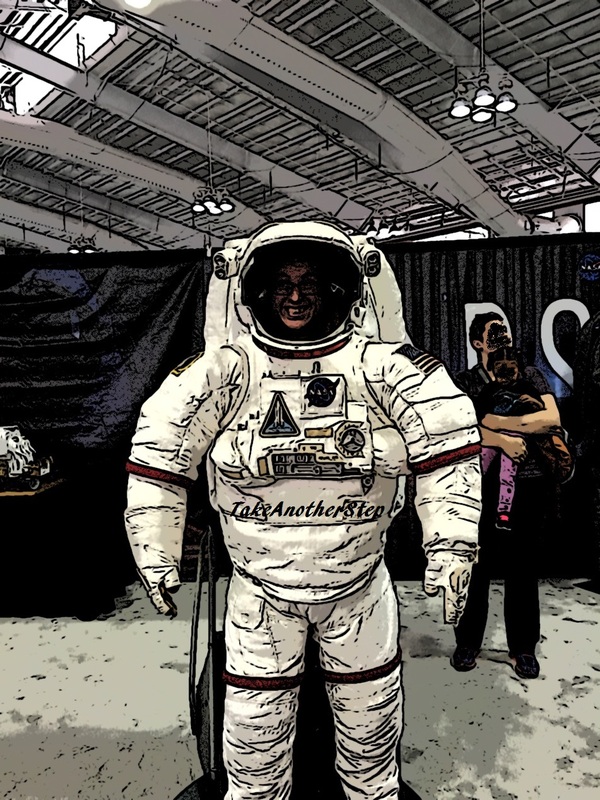 We got to see and meet quite a few people……. The only Original Series cast member there that day was Walter Koenig. 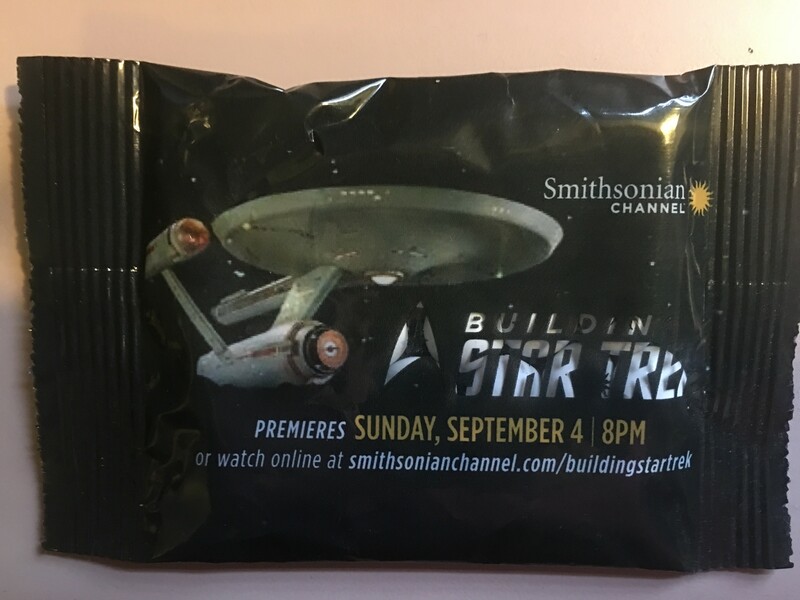 William Shatner was scheduled to appear on Sunday. 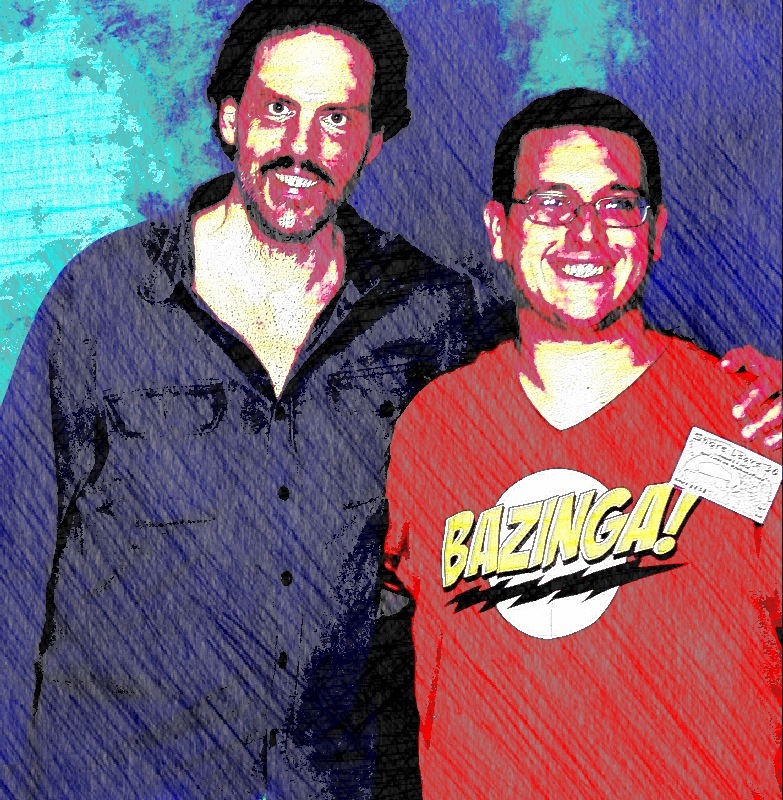 DC met him at NY Comic-Con a few years earlier so we weren’t disappointed that we would be missing him this time. Of course, if he happened to have been there we surely would have been in his line too. There were a good number of TNG cast there as well. We did not get to see all of them, but we saw Levar and Gates McFadden. I asked him who he wanted to see next. He looked around toward the Deep Space 9 section and answered “Jake”. I was a little bit impressed with that since he has only been watching for a few weeks and I was not sure how much he was actually paying attention. Of course by the time we got to the front he did not ‘renember’ his name but that was all just a matter of him not understanding the question or that the question was not asked in a way he understood. He will typically give a lot of random answers until he is asked properly – unfortunately one never knows what “properly asking” might be on any given day. There are times when he can answer a question correctly the very first time the question is asked and other days, the question has to be asked in many different ways. He saw Quark over in the next line. Quark, not in costume is only the principal from Buffy to DC. 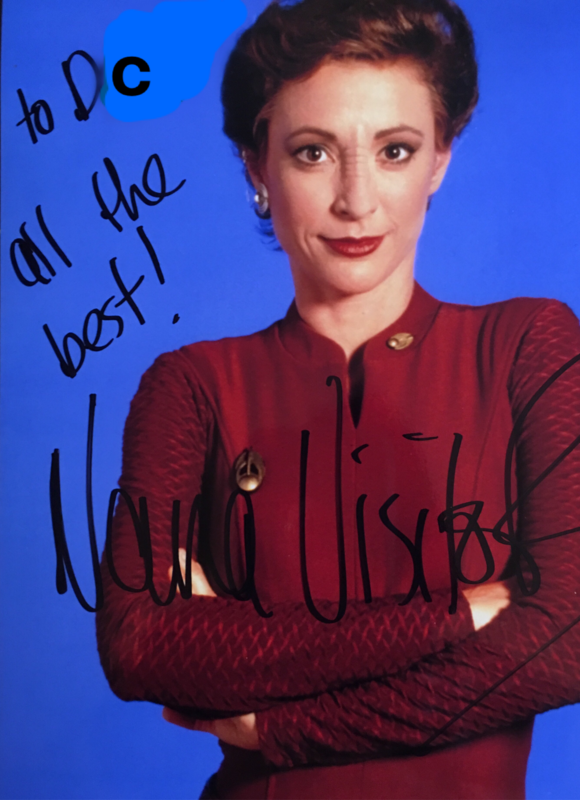 His line was a little bit longer than the others so we skipped over to Nana Visitor. DC was his charming self but when she told him her name he really got excited. He was clutching his chest and squealing with the biggest smile on his face. I was not expecting that reaction. 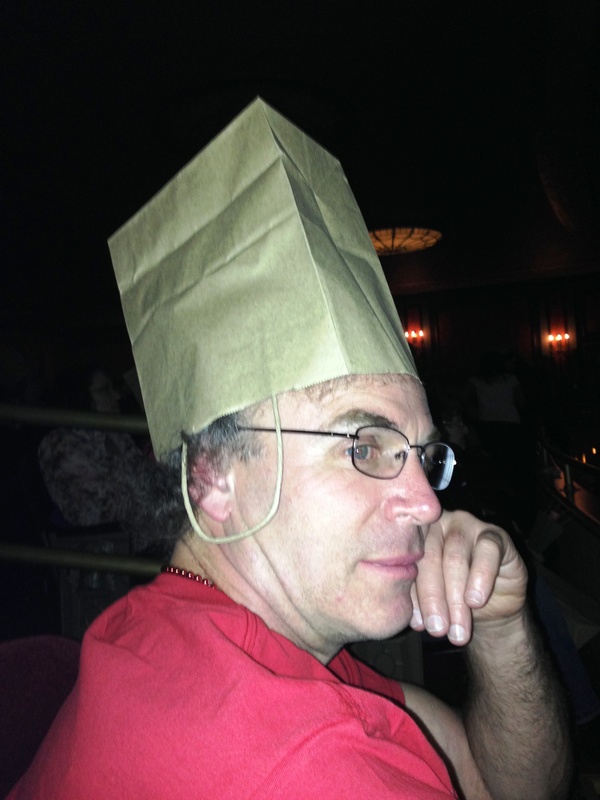 I don’t know about any of you, but most of the time when I take DC to a play, event or something of the sort, I spend more time watching him get excited than I do watching the play or show or whatever is going on. Then I get teary-eyed. That is just what happened here. He just was so thrilled to be talking to her and she was just so cheerful and upbeat with him that I not only got teary-eyed, but I thought I was going to burst out into an all out ugly face cry right there. It was tough trying to keep my composure. When we finished and headed back over to where Doug was holding up the pole he thought something had happened as it was pretty apparent that I was trying to contain myself. When I tried to explain it to him I got all choked up again. Sometimes I just fall apart when I see him so happy – I know, I know, get a grip, woman…. We walked around a little bit more waiting for the rest of our photo-ops when we came upon an attendee all dressed up in a long flowing gown. DC could hardly control himself. She was talking to people and not paying attention while DC was yelling “Excuse me! Excuse me!”. I had to keep telling him not to touch her dress but he wanted her attention so he tapped her on the shoulder before I could stop him. When she turned around the first thing he said was “Sorry to touch”. She smiled and told him it was all right and he said “Dress Beautiful” (and another squeal). That was all he needed to do; get her attention to tell her that her dress was beautiful. She thanked him and we were off to look at everything else there was to see. 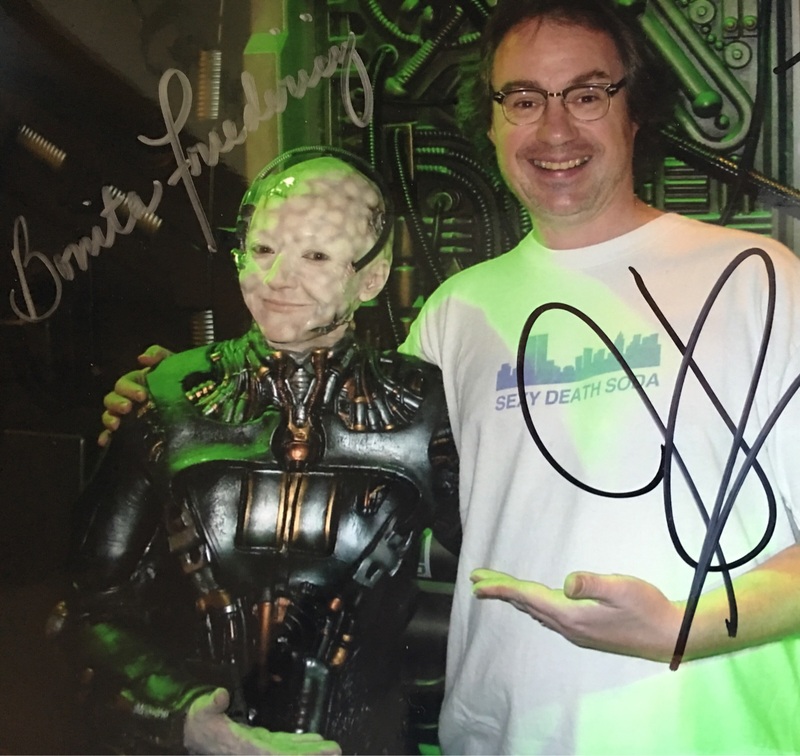 He got to see his beloved Nana again at his DS9 cast photo-op (and Buffy’s ‘teacher’ who we never made it back to in the autograph lines). 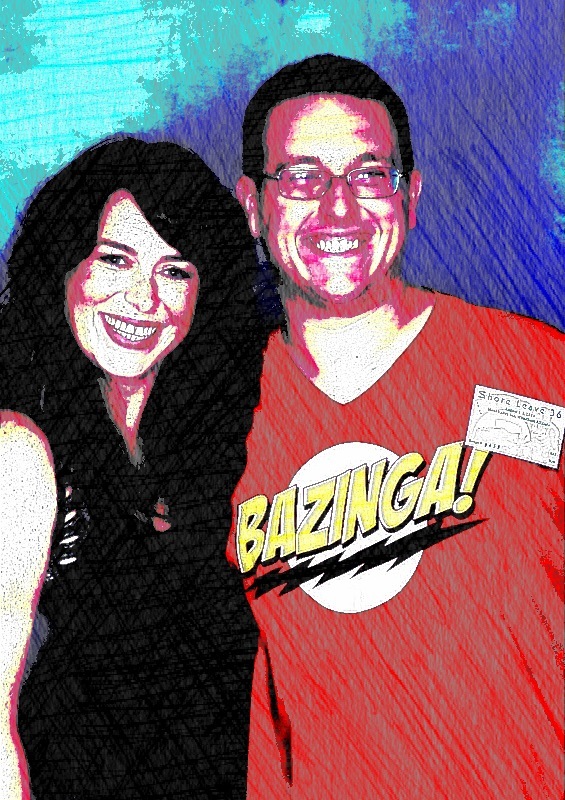 I think she may just have earned herself a place on DC’s favorite women list alongside of Felicia Day and Amy Adams. What a perfect day! Everything went exactly as planned. The whole event was very well organized and of course it helped that it was not very crowded. 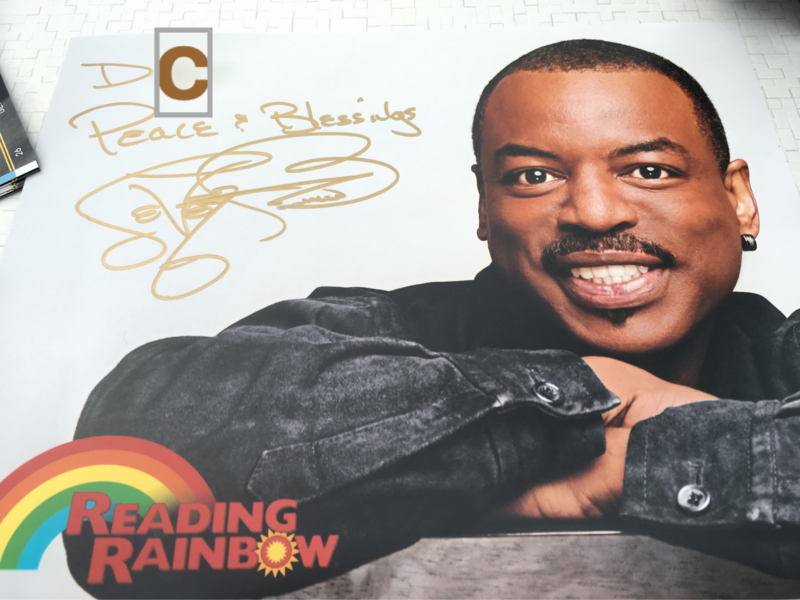 In case anyone might be wondering; the Reading Rainbow theme remains trapped in my head, still. But oftentimes “change” or loss is something that we do not embrace very readily or happily. And there are those days when the Facebook memories, we enjoy so much are not very enjoyable at all….. It is hard to believe that a year has come and gone ~ I have said goodbye to many of my childhood/teen age icons in the months since, but this was the first and by far, the worst in that long line of loss…. 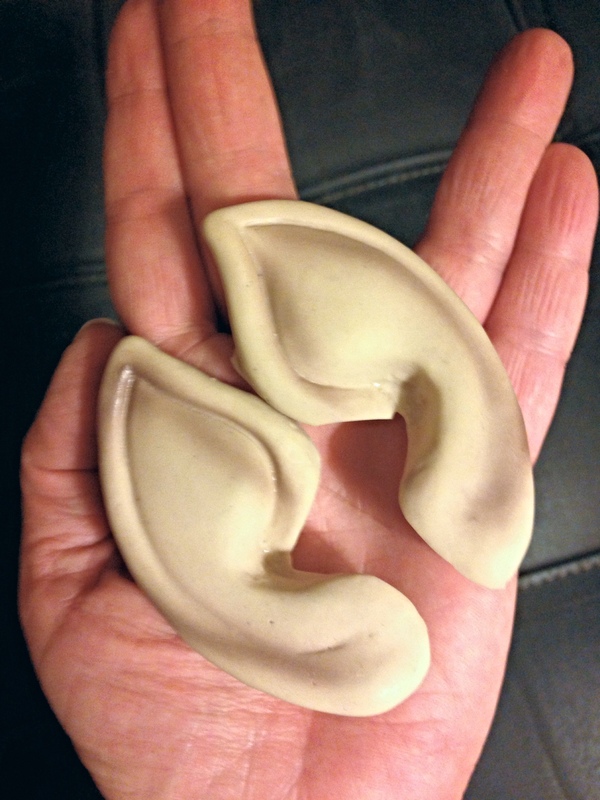 Repost Feb 2016 – from Feb, 2015…..
Live Long and Prosper ~ wherever you may land. Recently, after writing “Leave the Shoe; take the chocolate” I commented to the only two people that “got it” that this was usually the case – I am sitting here just cracking myself up…… alone. In the event that it still isn’t apparent to everyone…….. I LOVE HALLOWEEN, and I couldn’t be happier that DC loves it as much as I do! 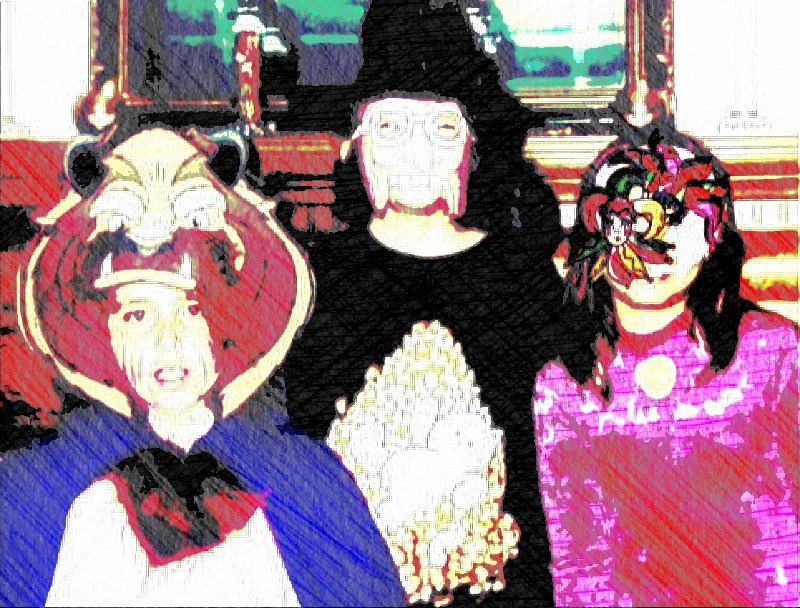 “But, no one will know what you are supposed to be”, is something I have been told quite often on Halloween over the years. I sometimes have a very odd sense of what is funny or what, I’m sure other people will get. They don’t always ‘get it’ but I am cracking myself up so no one else needs to join in. DC and I begin planning Halloween in August. 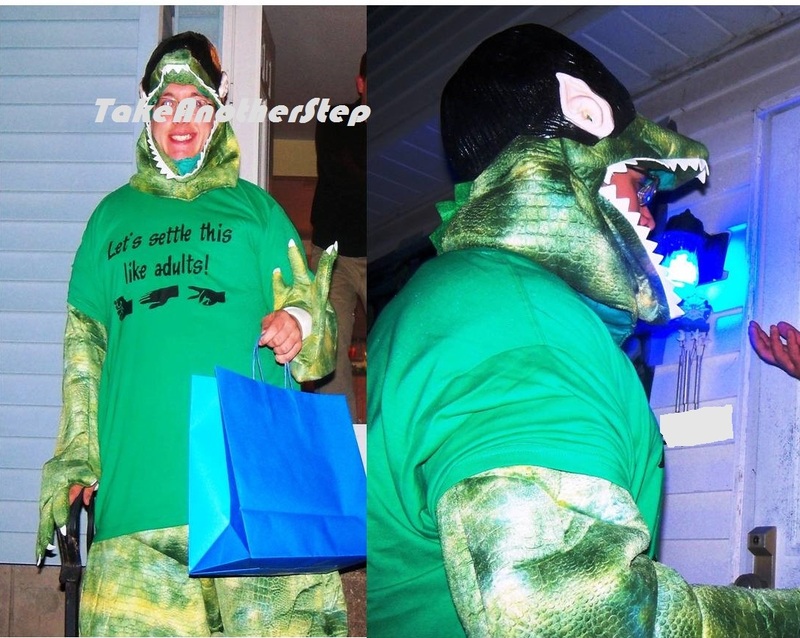 He must have a costume for every event he attends and me, being me, just LOVES this! As I can always come up with the odd costume, again, thinking I am just totally hilarious, more often DC will come up with a costume that is not a costume at all, just a character wearing regular clothes or worse, a costume that does not exist or that no one has ever heard of except for DC – who is watching very old or obscure musicals or Disney movies. 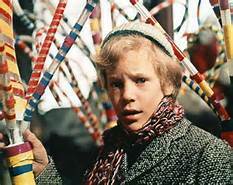 There was the year that he wanted nothing more than to be “Charlie Bucket” for Halloween……..
Basically, Charlie Bucket is a boy with blonde hair. In my mind Charlie’s birthday scarf was red – it wasn’t, but I think I duplicated the jacket (doesn’t show up well in the photo, but it was very close), the hair and hat as closely as I could. I added a Golden Ticket to his trick-or-treat bag, for added recognize-ability and I think I came pretty close to turning DC into “Charlie Bucket”. 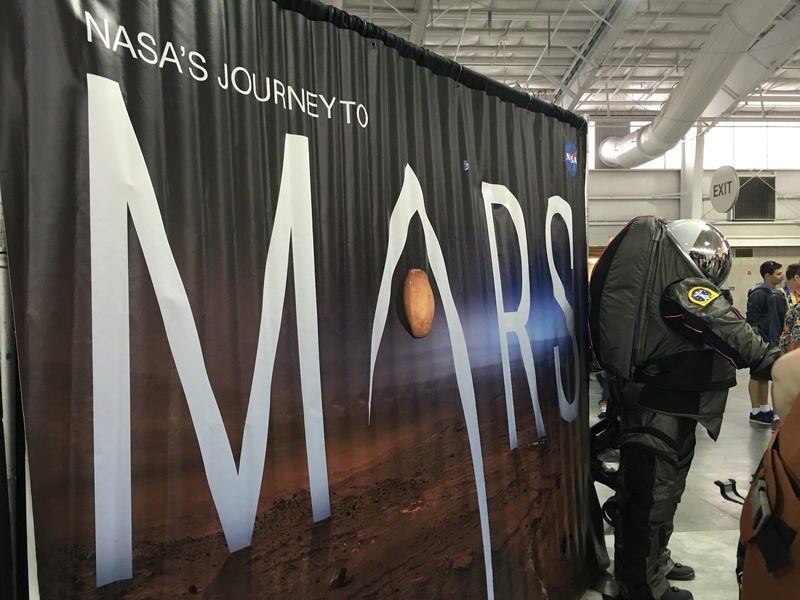 and ……on a side note, the bag must always match the costume…. 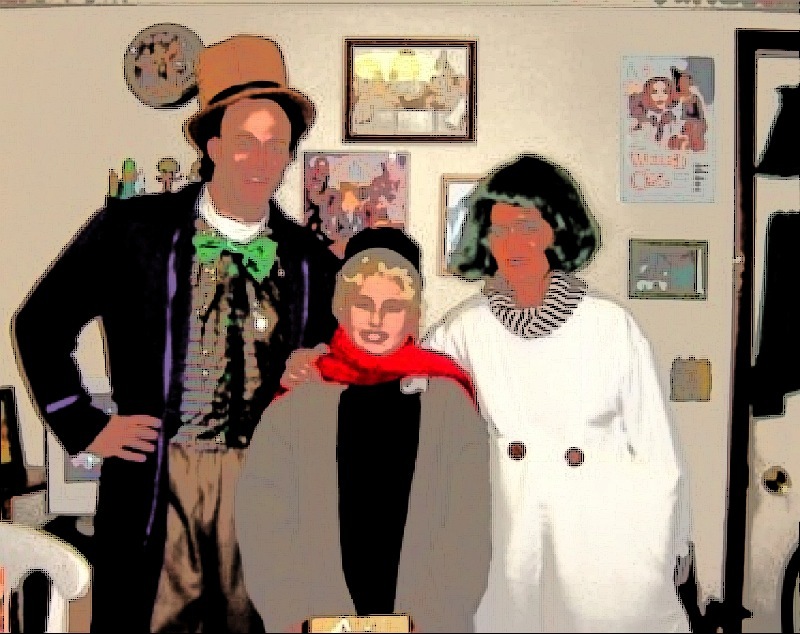 Even with the addition of Willy Wonka and an Ooompa Loompa , people who did not know DC personally had no idea he was in a costume..
Then there was the year that DC wanted to be “Daddy Warbucks” from one of his favorite musicals, Annie. I had planned to dress as Annie, but I broke my toe – the first in a very long line of toe-breaking incidents – so I could not walk around the neighborhood with him. Still, I assumed that most people would know who Daddy Warbucks was even without Annie by his side………They didn’t. 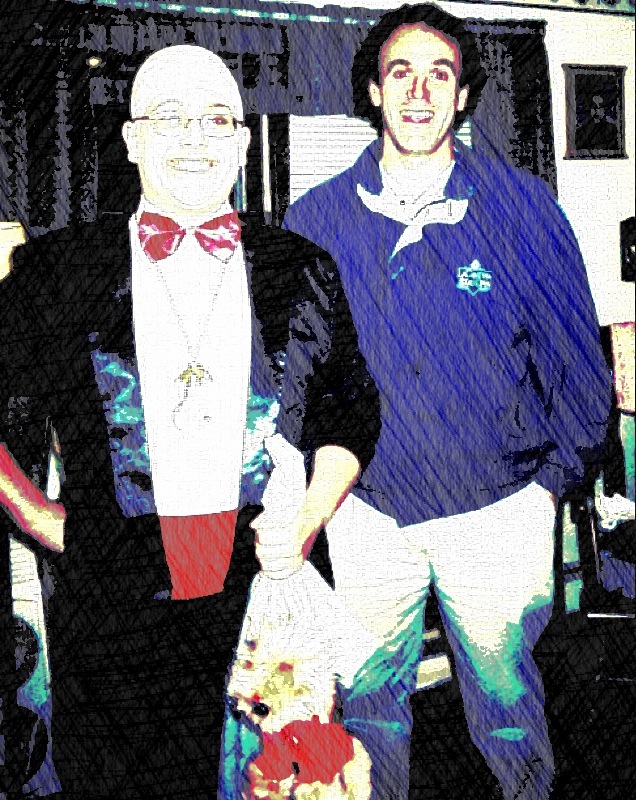 Even with the addition of Sandy the dog to his trick-trick-or-treat bag, most people thought he was Mr. Six. I always do try to embrace his costume requests especially when he does come up with a character from a TV show or movie that is more age-appropriate than his usual choices. Generally when he does actually choose something or someone from a television show, it is usually a show that has not been on the air for years. He tends to discover favorite TV shows long after they are out of the public eye, but progress is progress and I will take it. This year, he surprised me. 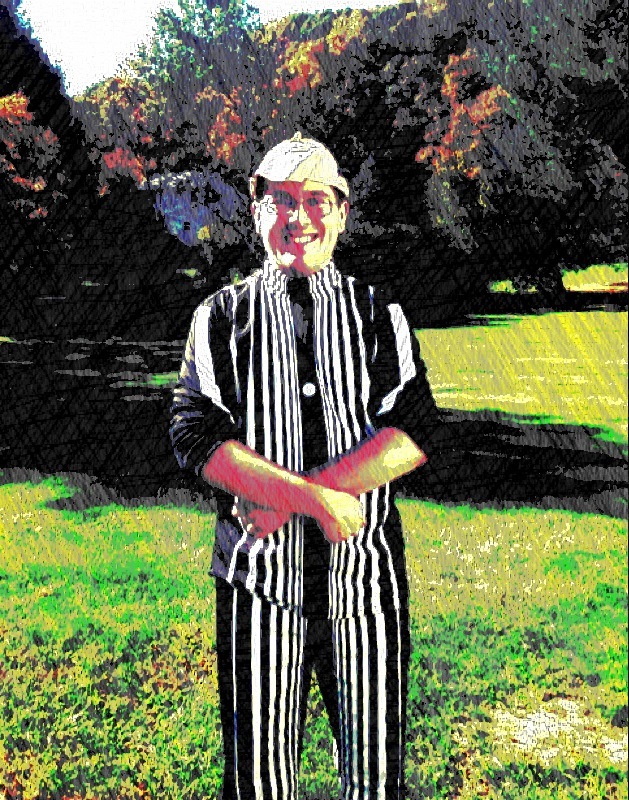 DC’s first costume of the 2014 Halloween season was “The Doppler Effect” (Sheldon – The Big Bang Theory) – He loves the Big Bang Theory and as I said, I will go out of my way to encourage anything he might like that is more age-appropriate than the TV shows and movies he normally gravitates to. 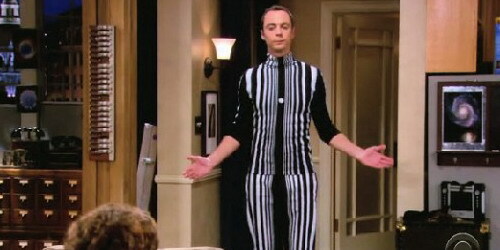 Obviously, he did not say “I want to be the ‘Dopper Inact’ (DC-speak)” but he did want to be Sheldon, which would have been easy to do, as he has worn his Bazinga shirt to death, so we went for the Doppler Effect. 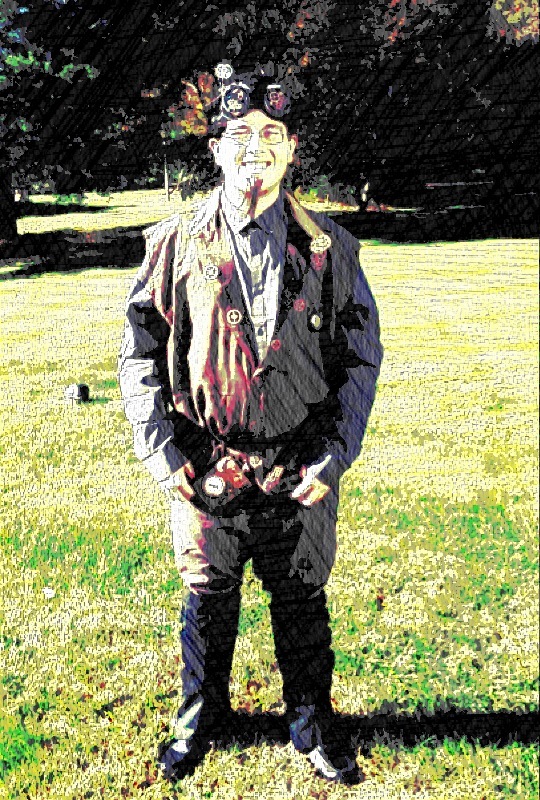 No, not everyone knew who he was “supposed to be”, but he didn’t know or care. It was funny to the people that did “get it” and that is good enough for me. 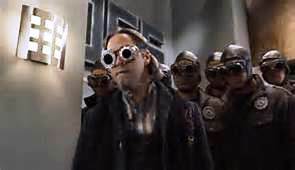 Our next party costume was one that, not only did I think no one would have any idea about, but it was really difficult to find a photo on-line to copy from – The Timekeeper from “Spy Kids, All the Time in the World” – and yes, we are required to say the full title of the movie every time it is mentioned. Fortunately, I found some “Bag O’ Gears” on Amazon along with goggles that looked close enough even before gluing said gears all over them. 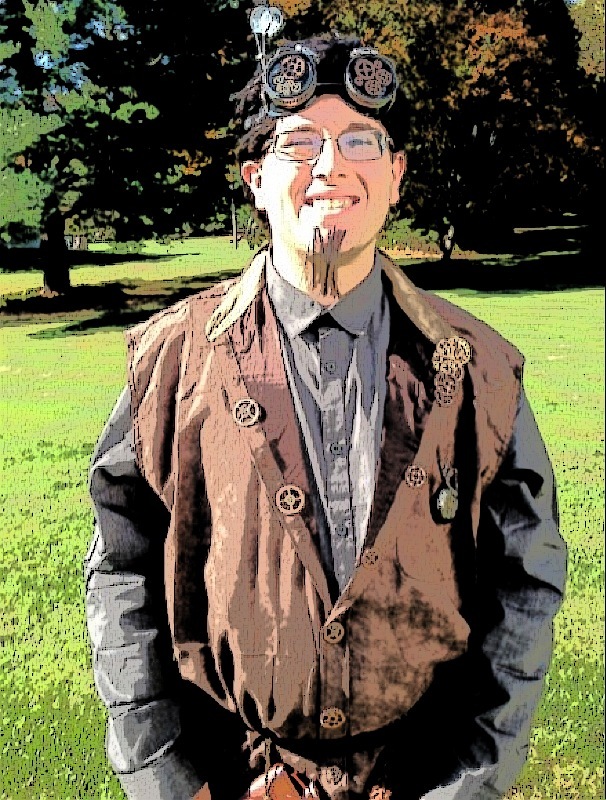 The costume, of course was not exact, it really wasn’t even close, but gears were added, a pocket watch and a flask with a compass, looking close enough to a clock to fit the theme. I thought it made the point and more importantly, DC loved it. As it turned out a few people other than DC had actually seen this movie and knew right away who he “was supposed to be”. The Timekeeper, the challenge of our Halloween season, “nailed”, according to a few reviews, we moved on to our final party before Halloween night. The Beast…. because of course, there must be at least one Disney animated character in the mix. 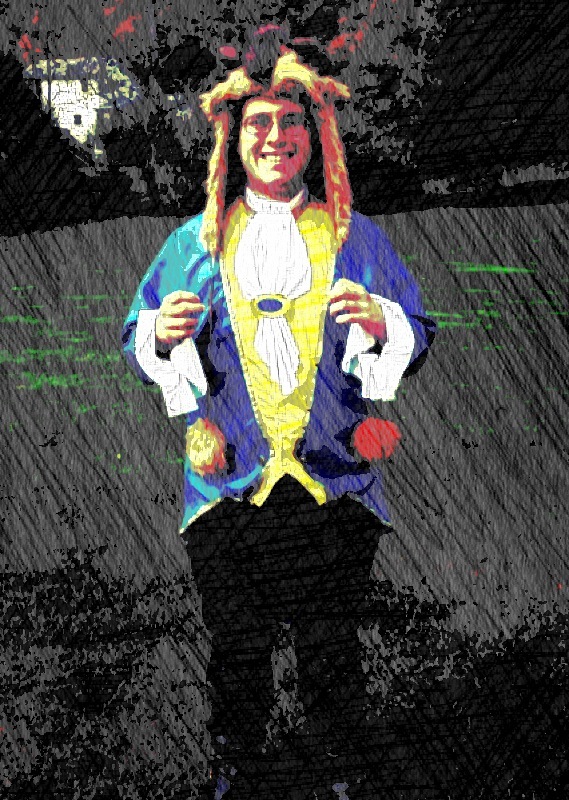 This was not DC’s first Halloween as the Beast, but years ago, it was much more difficult to find a Beast costume, so again, we had to go “makeshift” and put random pieces together to get the effect. A friend of mine happened to have a mask, so that really helped. This year, he had the real thing, straight from the Beast’s wardrobe – because, as you know, the Beast is no longer a Beast, he is a handsome Prince, he has no need of this outfit anymore. The one costume that continues to make the list from the time DC was very young and still to this day is “Jim Dear” from Lady and the Tramp. This year, while purchasing a 40’s style hat for DC to wear to an event we attended, I came across and purchased a derby type hat as well. Next year I will give in to his request for a “Jim Dear” costume. I suppose I will be shopping for a stuffed Lady and Tramp, and whatever else I can come up with to make “Jim Dear” recognizable. I have 10 months to think about it. I began writing this post almost two weeks ago after DC attended his first party of the season, holding off publishing until the last costume of our season ‘dropped’ – on Halloween night. 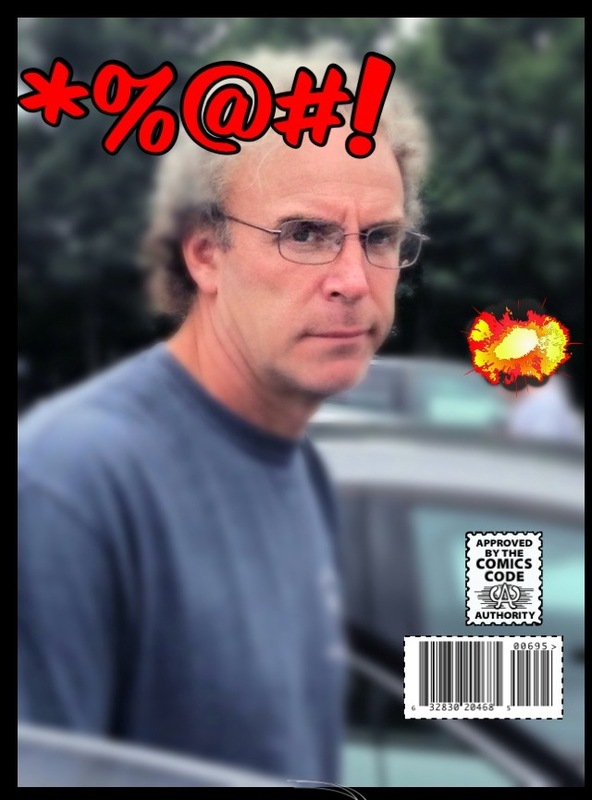 The following is a combination of my encouragement of DC’s affection for something popular, age appropriate, something he actually thinks is funny, and me thinking myself quite hilarious. 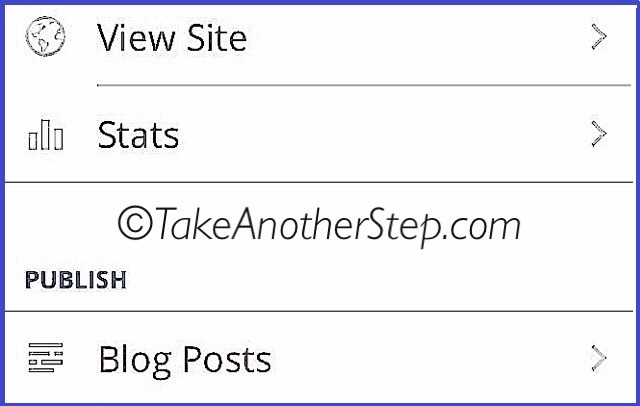 Every once in a while Invisible Strings publishes a post listing the “search terms” that brought readers to his site. I do not know if this is a regular thing that he does, but I’m pretty sure I’ve seen more than one. His “search engine” posts are usually written to make a specific point (this post is not). I always find those posts interesting of course due to the point he is making but also because I love the fact that we are able to find these “search terms”. I have often wondered how people found their way to my site. Of course there are the people who officially follow me and others I know read from twitter (and twitter) google+, tumblr, facebook and the many other places this blog is posted and shared. But how does one just happen upon it? After a little bit of searching through my ‘stats’ page, I finally found the list of search terms. Some were pretty close to what I expected, some were interesting and others a bit surprising. This is one of those posts that I put together and save to post later when we are away or when I am really busy and really don’t have the time to write. Like the “Blog Title Series” (Series? Yes…. there’s more), they are very often off topic or “fluff”. I like fluff, sometimes fluff is fun. There are hundreds of “hits’ that are categorized under “unknown search terms” (so…. I guess THAT would “officially be my top category 🙂 ). I wish I could see what those terms were, but as they are unavailable to me, I’ll just go with what I CAN see. “Autism Ravioli” was a puzzler for a minute but I am guessing the clicks went to “Progress with a side of Pasta” or “Please pass the garlic bread“. Next we have two or more searches for the same or close to the same topic. I believe at this point if anyone were to search “band-aids and autism“ it would be difficult NOT to find my page. The biggest surprise for me here is that THE most popular search terms(s) that brought people to my blog had nothing to do with autism at all. 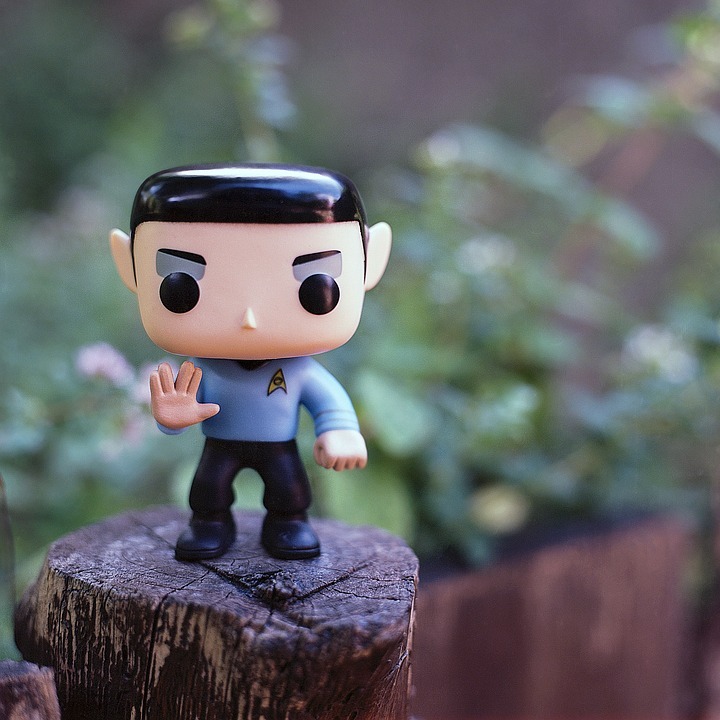 The largest set of terms that brought people to me – were terms having something to do with Leonard Nimoy or Star Trek! logic is just the beginning of wisdom, not the end”. I can not say that this does not make me very happy!!!! 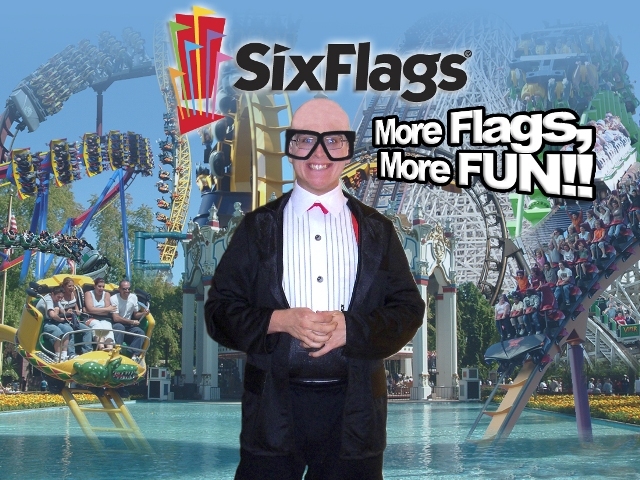 Photo Credit – Six Flags Amusement Park and *Al (at work) – Graphic Artist who works magic with my Halloween Pics every year. The Timekeeper,the challenge of our Halloween season, “nailed”, according to a few reviews, we moved on to our final party before Halloween night. 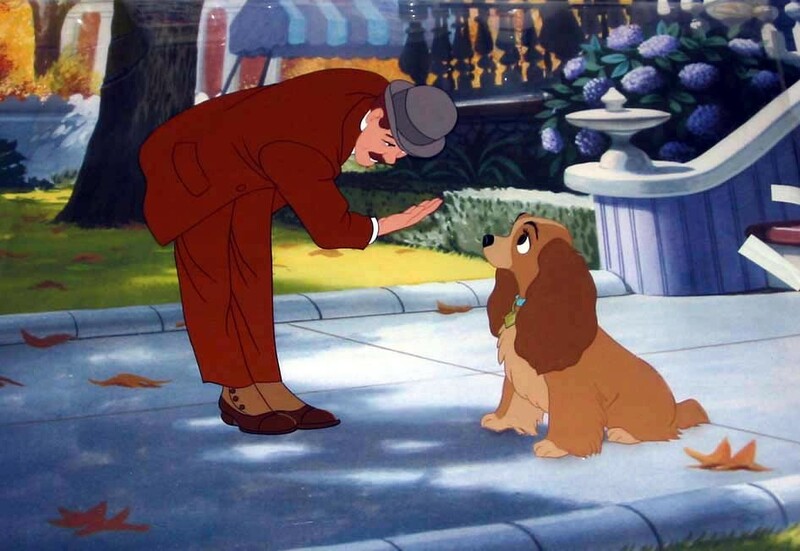 “Jim Dear” and Lady – Photo Credit – Disney’s Lady and The Tramp. We are just going to let you guess.